Whether you watch hockey or not, you’ve probably heard the name Sidney Crosby and you probably know it belongs to the NHL’s poster child. Sidney Crosby is just about as good as it gets when it comes to hockey players these days. He’s been considered by many to be the next Wayne Gretzky and for the last eight years he has gotten as close to meeting to those expectations as anyone could when compared to “The Great One”. 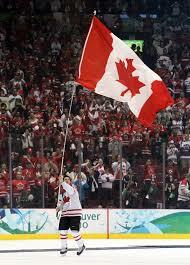 It’s no wonder that Team Canada selected the hero of the 2010 Games to be their captain at this year’s Olympics. Crosby’s goal is to lead Team Canada to back to back Gold Medals, something that has not been accomplished in the Olympics since Russia captured the Gold in 1984 and 1988. “Sid the Kid” is used to coming through in the clutch. He emerged as a top notch prospect at 15 when he skated for Shattuck-St. Mary’s in Fairbault, Minnesota. In one season alone, Crosby scored 72 goals and led the school to a U18 AAA national championship. From there on, he only got better. Crosby is no stranger to winning medals in international competition either. He won gold and silver in 2004 representing Canada at the World Junior Championships.1 To say the least, at twenty two years old, Sidney Crosby was already an extremely accomplished hockey player. After his performance in 2010, hockey fans around the world are watching closely to see what Captain Crosby has in store for Sochi in 2014. There’s no doubt that he’ll have an impact as the leader of the Canadian hockey squad; it’s only a matter of how memorable he’ll make the games for his home country and hockey team.